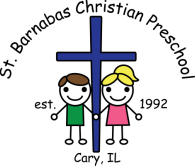 The business and affairs of St. Barnabas Christian Preschool shall be governed and managed by the Board of Directors. The Board of Directors of the preschool shall be no fewer than five (5) or more than twelve (12) and shall include the officers of the preschool and the Director of the preschool. Two-year terms start June 1 and end May 31 and members shall serve without compensation. The majority of the members of the Preschool Board shall be members in good standing of St. Barnabas Lutheran Church. The President or Vice President of the Preschool Board shall be a member in good standing of St. Barnabas Lutheran Church. The Senior Pastor of St. Barnabas Lutheran church shall be an ex-officio member of the Preschool Board. The Board of Directors meet monthly and shall hold their annual meeting within one (1) week of the annual membership meeting at which they were elected, at a time and place mutually agreed upon by a majority of the Board members.